Due to the earthquake Firestation 61 is still being checked out for damage and is not allowing the use of their meeting rooms. Hopefully folks survived our little shake and things are getting back to normal. If you did have any significant damage, please check the MATSU Emergency Services Facebook or web site to get assistance on getting things repaired if required. MATSU ARES and hams around the borough and southcentral were quite busy for a while. Lose of commercial services mainly centered around roads and electric outages. With building and dwelling damaging varying up and down the area. We activated nets around the south central area in Anchorage, Kenai, and MATSU and began collecting reports. After folks checked out their homes, vehicles and family situation, mobile units began checking out their neighborhoods, local business and what resources were available. We did not lose the internet and land lines in a lot of areas. Cell service had various outages. Texting appeared to work when phone calls would not go thru in some areas of the cell system. Water problems varied around the borough depending on how deep your well was and several other factors. The highways and road system took a lot of hits and we received very accurate reports on where the problems were and how bad. Our units checked bridges and rail crossings, where gas and groceries were available, alternate routes round the road problems. Our schools took some hits, luckily only minor injuries occurred throughout the areas. We established Comm links on the Ak Pacific Net (14.292) to the North West, Saturn Communications Coordinator out of Calif, who relayed into to this HQ in Washington DC. We establish our local HF net on 3920, and received reports from Cordova, Valdez, Kenai Area, Tok, North Pole and Fairbanks. Local VHF nets on 147.33, and 147.30 were established. Backup systems on 146.67, 146.85 and 147.18 were on line if needed. Winlink was established on VHF and HF receiving and sending traffic in and out of the area. 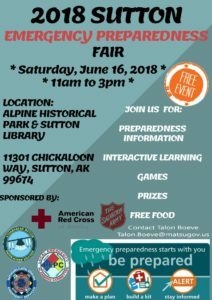 Hams throughout the borough assisted in obtaining information as well as Chugiak, Eagle River, Anchorage, Homer, Sterling area. Our Comm trailers were checked and were ready to go if needed. Due to no loss of internet or land line, the borough did not activate us for back up comes but really appreciated the information that was collected and passed on to them once the EOC was setup. I want to thank everyone who assisted and in the true Alaska sprit, neighbor helped neighbor. Things to ponder and prepare for before another situation arises. Keep your fuel tanks to at least 3/4s of a tank. Have your go boxes, put together and ready to go. Emergency rations, water, medications, warm clothing and things for your pets. If you have a fire place is it working, do you have wood, when was the chimney last cleaned? Do you have an emergency generator with spare fuel? Have spare batteries for flashlights and small items on hand. Have a bag with your radios ready to go. 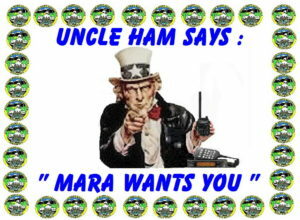 Please give some thought to getting operational on Winlink and both VHF and HF as your license permits. You will want to have spare water filters on hand, also air filters for your vehicles, in case we have volcanic activity. Join our ARES Net on Thursday nights at 2000 on either 147.33 or 147.30. This will allow you to test out your equipment and antennas. We have various themes each week to evaluate your capabilities. HT and Cross banding, Mobile operations, checking radio paths from Red Cross and Salvation Army locations, radio go boxes. Pet emergency plans, backup power. Let’s help each other and be ready for the next possible event. If you need assistance, check out the club web page, were we list our Elmers. MARA will be having our before the meeting lunch at Marcello’s in the Value Village shopping center in Wasilla, Thursday the 20th ,at noon. Real good Italian, Greek and American food. See you there. Our next Comex will be “Where’s Rudolph?” It will be on the 22nd of Dec. MATSU will activate Bushmaster Operations and train on Winlink, go kits and message formats used with our supported agencies like the ICS 213. Please contact Don at dbush@gci.net if you can attend. Our training for the next few months will be building teams to deploy to support borough operations from various locations as needed. We will be interfacing with our CERTs teams also. Dates and locations will be sent out after the first of the year. The MARA Christmas party will be held the 28th of Dec at the Wasilla Boys and Girls Club at 3700 Bogard Road. This will be a potluck, please bring a side dish or desert. We will be having he famous Chinese Auction, gifts $25.00 or less, please no boat anchors. Setup will be at 1830. See you all there. We are starting to get our meeting programs together and ready for this next year. Please send your suggestion for programs or if you have a programs you would like to share, to our VP Lou/KL4NK the program coordinator. Our January program will be Alaska Shield. This is the state’s major emergency drill, that’s held every 2 or 3 years. It will be in the April time frame 2019. We should be getting our technician class together just after the first of the year, contact John/AL7LA if you know of someone who wants to take the course. With the first of the year coming up Club Dues are due. Please check with the Treasure John/KL1XM to make sure you are up to date on your contact info. You can get a copy of the club application on the www.kl7jfu.com website and email to him and you also can pay your dues thru the website. You can join ARRL thru the club as well, remember ARRL supports ham radio throughout the US with programs like LOTW, training material, reference books, contesting, building projects, new equipment evaluations, lobbying for frequencies and tower ordnances, equipment insurance and supporting club activities. Please let the treasure know if you have renewed your ARRL dues else ware so we can keep the roster up to date. Thank you for your support. Folks interested in joining MATSU ARES, contact me at dbush@gci.net. Our ARES website is located at www.kl7jft.org that has all our Emergency Operating Plans, SOP and other useful emergency information and the ARES application. If you have completed any of the ICS courses, 100, 200, 700, 800, please send me a copy of your certificates. Also if you are interested in the Army Mars program, you can contact me or Ron/KL7YK for information and requirements. Anyone interested in joining CERTS and getting training, contact Tabitha/KL4FZ. This may be interesting you: 14 Essential Knots for Every Survival Situation You May Encounter! This is the link: http://www.survivaldispatch.com/14-essential-survival-knots/ — You never know when you will need to use a rope and if you do need it these knots become mighty important. We have Emergency Coordinators for various areas around the borough. Feel free to contact them to let them know you are available to assist during emergencies. They can give YOU additional guidance for your area. This is a few items to look into and take care of. I want to wish you all a Merry Christmas and Happy New Year. Enjoy a safe and enjoyable holiday season. 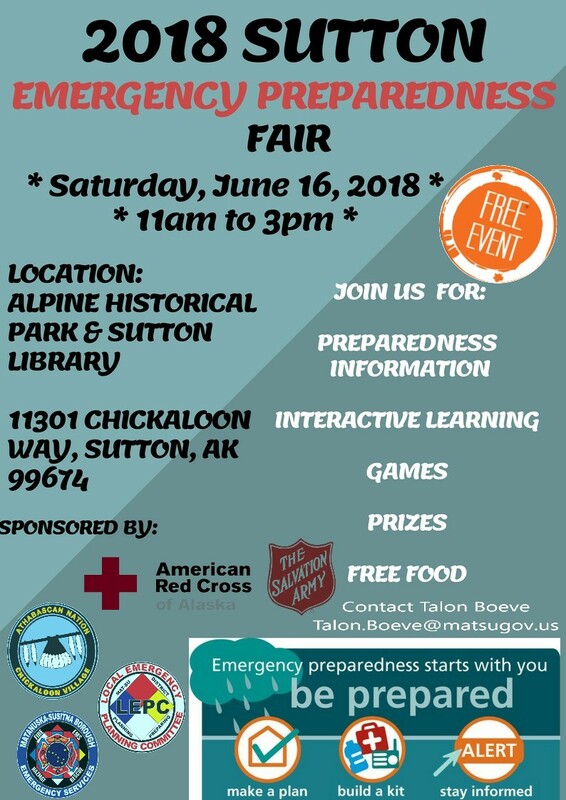 Saturday, June 16 will be the Sutton Emergency Preparedness Fair. We will be setting up both trailers. This will be a dress rehearsal for the MARA Field Day. We need folks to show up at the Sutton Library about 0900, tear down will be around 1600. We will be training folks on tower installation, generator ops, beam and wire antennas, and equipment operations. This training will be critical for a good field day operation. Please contact Don/KL7JFT if you can attend. There will be a VHF Contest being held on Saturday June 9th 2018. There will be folks up on various VHF frequencies. Home stations and rovers will be around the state trying to make contacts. The rover route for the Hune VHF Contest is still on. just outside of Soldotna, up through Anchorage, and then to the Talkeetna area on the first day. on the truck, but everything should be ready before the contest. I’m planning to operate on 2M, 6M, and 70 cm for this run. I had hoped to also run gear on 220, but wasn’t able to pull everything together in time. contact me again in a different grid square and it is good to go for the rules. I spoke of the basics at our January meeting and need to clarify and provide links to each one. It was brought to my attention that it makes sense to complete them in the following order, not numerical order…..